Originally, the local production Nasi Lemak 2.0 辣死你媽! 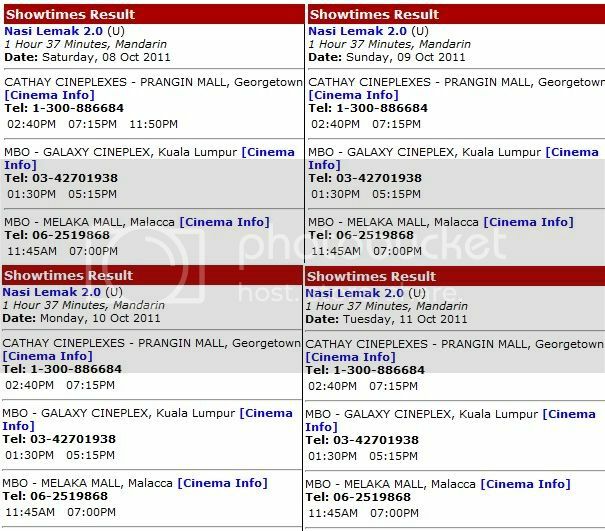 was set to be taken down from local cinemas on the 13th of October 2011. 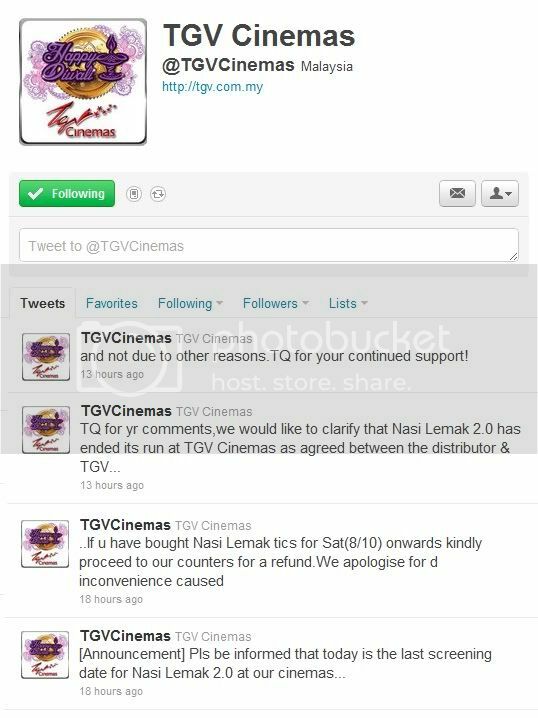 However, just yesterday, both official Twitter Accounts of GSC and TGV Cinemas made an official statement through tweets saying that the controversial movie Nasi Lemak 2.0 will be taken down effectively from today onwards. 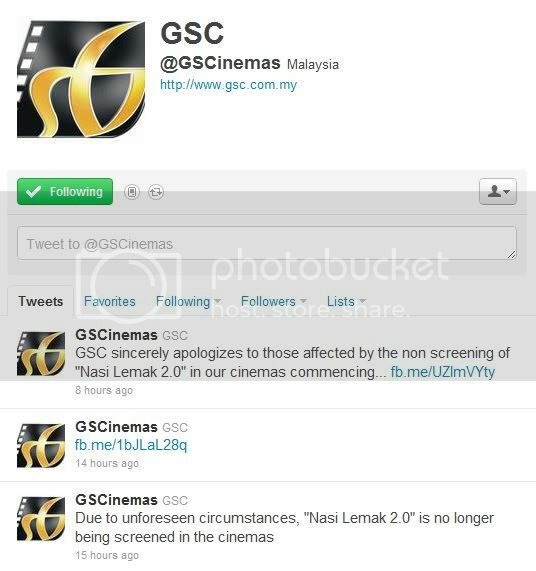 Yesterday, 7th of October is the last date the movie was shown on screens of GSC Cinemas & TGV Cinemas. The notice came in pretty last minute which caused the public making assumptions. However, for those who haven watch the film, if you want to do so, MBO Cinemas and BIG Cinemas are still showing it with limited sessions per day. So far i’ve checked, the movie will still be shown up till the 12th of October on both MBO Cinemas and BIG Cinemas. Alternatively, you could also catch the movie on Astro First Channel 480 where they started broadcasting the movie from 7th of October 2011. Seriously, if you haven watch the movie, you should do it in the next few days. It’s a pretty decent local production. 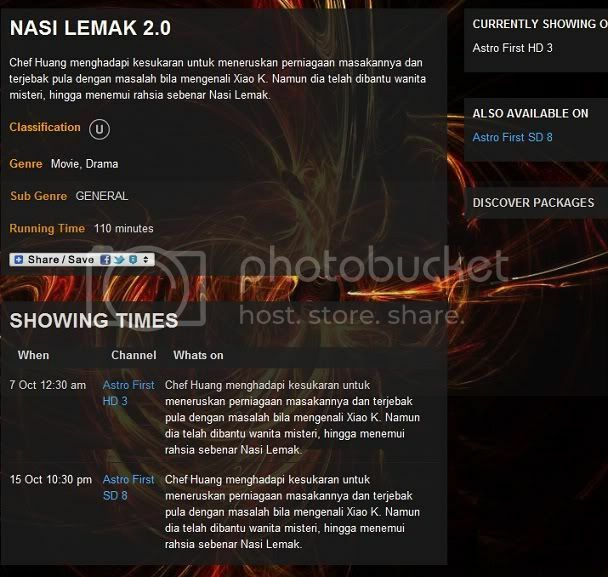 Here are some facts about the movie – Nasi Lemak 2.0 辣死你媽! – The average cost of a Malaysian film is between RM1.5 million and RM2.5 million. – Cost for Nasi Lemak 2.0 辣死你媽! is under RM1 million (Origins of the funds unknown). – The movie has been up and running in local cinemas since 8th of September and has raked in more than RM5 Million (5,000,000) at the local box office earning positive reviews from most movie goers.